Exposed is a lightweight SQL library written using Kotlin language. In this article I will demonstrate this library with some simple examples. I will create some test tables and perform CRUD operations on it. 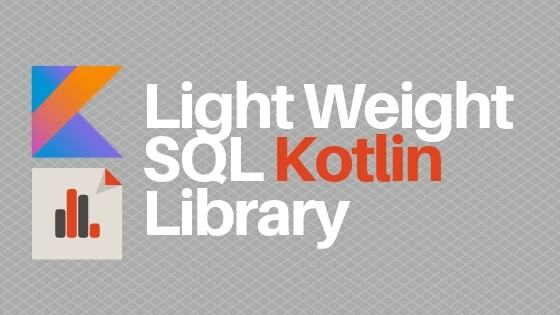 I was looking for some light wight SQL library for quick and small application and found Exposed. It is so simple to learn. Exposed have two layers of database access: DSL and DAO. In this article I will use DSL layer. To make it simple I we use only single kotlin file to perform all database calls. If you want to read further about exposed then, here is the link to its github repository. Create a new Kotlin project in your IDE and add below dependencies in your build configuration. org.jetbrains.exposed depends on slf4j and joda-time so included logback and joda-time. We are going to use h2 in-memory database so add h2database. We are using Employee and Company entities as example in this article. Employees work in a company so employee will have a reference to the company. In object relational mapping libraries we use annotations to provide relationship between table and class but in exposed we use Kotlin’s object to provide mapping information. Create a new kotlin file in the project ExposedDemo.kt and write below code in it. In Kotlin object declaration is used to create Singleton instance. Once an object is declared we can refer with its name directly with out creating instance. We created two objects Employees and Companies and these objects are extending Table class. In Companies we need id, name and city columns so initialized these fields by calling respective functions based on there data types. integer: Creates integer Column. Takes column name as parameter. primaryKey: Creates Column of primary key type. references: This is an extension function in Table which is used for providing foreign key relation. Now we have objects which extends Table and declared some columns in it. By this we completed our initial table mappings. We will now write our main() function which is the starting point of kotlin execution. <1> Load driver and connect to the database. In this case we are loading h2 database driver and connecting to it. <2> transaction is a function which takes an extension lambda of org.jetbrains.exposed.sql.Transaction class. Every thing with in this lambda are executed in a transaction context. <3> Configure logger to view generated SQL statements. <4> We are using in-memory database so tables will be created on every application run. SchemaUtils provides utility functions to create tables. Run this code to see SQL statements in the console log. In the next sections we see examples of CRUD operations. Inserting new records into the table is so easy. Exposed provides insert function which will take an InsertStatement. Lets insert some rows into the Company and Employee tables. insert is an extension function which takes InsertStatement. it in the insert block refers to the Column, I assigned all new values to this instance. For Employees I used semicolons to separate the statements to make code shorter, but that is optional. Query data from the database using select function. There are many versions of select functions available below are some examples. <1> selectAll returns all the rows from table. This function returns Query instance and on which we can call forEach to iterate the results. <3> To get only Employee.name in the result use Slice function which will return only provided list of columns in the result. Update the rows using Update function. This function takes SqlExpressionBuilder using which we can pass the where condition and the new values can be assigned to the column instance. deleteWhere function deletes the all the rows which satisfies the passed condition. Employee record with name ‘Sam’ gets deleted. Inner join is the most common way to join two tables. In below example I will join Employees and Companies. innerJoin is a infix function which takes a column and returns Join. We can then call select on it to pass the where conditions. I want all employees who belong to company id 2 and then iterated on the result to print. Result will have all columns from Employees and Companies but for to get only some columns then use slice. In this article we learned using Exposed SQL library to perform CRUD operations on h2 database and here is the link for the code.